Many traditional bikes have cottered cranks. On these bikes, cotters, or cotter pins, are used to attach the cranks to the bottom bracket. If your pedals flop once per rotation this is probably due to wear in the cotters. It's easy and cheap to fix. It can be difficult to remove and replace cotters. To remove, a hammer is usually the easiest option. Support the crank (this is important) so that you don't end up hammering against the bearings, remove, or partially remove, the nut from the cotter and hit the threaded end with a hammer. When the cotter is out you can fit a new one from the opposite side. Note that this also needs to be fitted firmly. Presses are available to do this, but a hammer works well. Don't try to use the thread to pull the cotter through as it simply doesn't work. Cotters naturally try to work loose, so ride for a few km before tightening again. 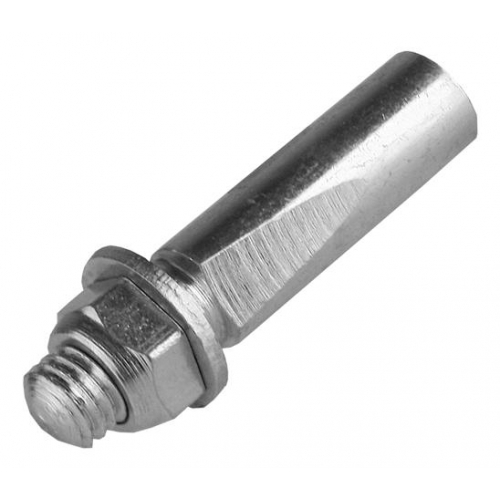 Cotter pins come in various sizes, the most common is the 3/8th inch 9.5 mm diameter. Please choose the size you need for your bike. Priced individually. You probably want two - one for each side.